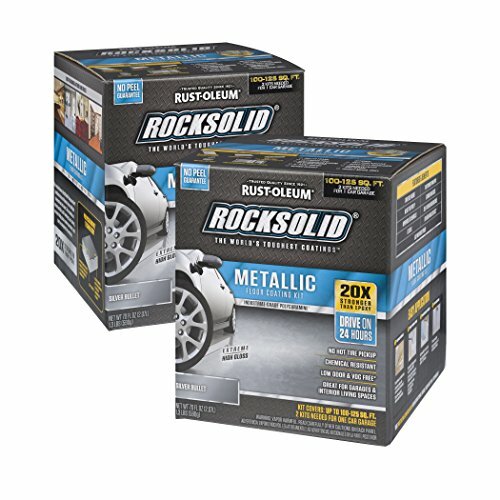 Rust-Oleum RockSolid 70 oz. Metallic Floor Kit offers unsurpassed durability. Made with a unique Polycuramine formula that is 20 times stronger than epoxy. Resistant to salt, oil, gas and other harsh chemicals, this is one of the toughest floor coatings available. Product formula is perfectly suited for high traffic areas like garages and workshops but still safe enough to be used in other interior spaces like basements, laundry rooms and family rooms. Zero VOC's and a low odor make it a great choice for almost any indoor application. Easy to maintain, lasts a lifetime while still looking fantastic.. Silver Bullet Metallic. 2 Pack!